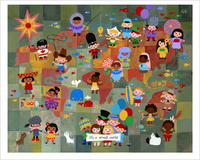 Timed with the release of illustrator Joey Chou's latest children's book from Disney Press, a select group of talent will contribute work paying homage to this beloved and enduring theme of global peace. 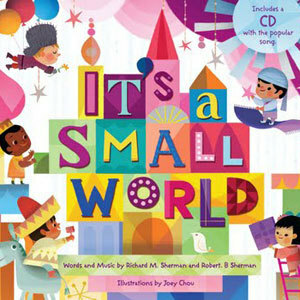 The book features Chou's illustrations interpreting the Sherman Brothers classic song written for the popular Disney park attraction. This is an all-ages event. Exhibiting artists in attendance including Joey Chou who will be on hand signing copies of the new release. 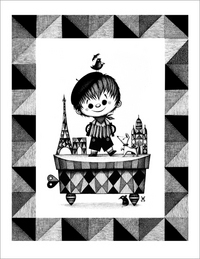 8pm: First Raffle Drawing - Signed copy of Joey's book and a new print from Seb Mesnard! 8:30pm: Patrick Awa, Brigette Barrager, Israel Sanchez and Joey Chou start live painting demos. 9pm: Second Raffle Drawing - Signed copy of Joey's book and 2 signed Joey Chou prints! 10pm: Final Raffle Drawing - Finished live demo artwork by Joey Chou, Patrick Awa, Brigette Barrager and Israel Sanchez! Raffle Entry Details: Get a free raffle ticket when you purchase a copy of the new book in person at tonight's reception. Additional tickets available for $2. Winners must be present to claim prizes.